Sarveshwara Dhyana Nilayam temple, situated at Tamaraipakkam, has a massive Shiva Lingam, which stands 90 ft from ground level. In fact it is one of the tallest Shiva Lingams in the world and is very unique. 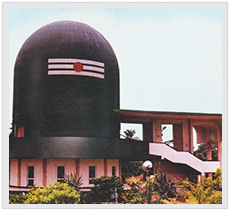 Gurudev Swami Chinmayananda meticulously planned and gave the blueprints of the unique model of Dhyana Nilayam with a huge 65 ft high Shivalinga-shaped dome, a spacious sprawling circular Satsang hall on the ground floor and the Dhyana Nilayam on the top-floor that was designed by M/s Vybogam Architects. Inside the temple is a rare Sphatika Lingam an 'endless' form in crystal, encrusted with a diamond studded crest, mounted on a special glass case. There is also a granite Lingam beside it. The consecration of both, the Sphatika Lingam and the granite Lingam were done on 15th October by Pujya Gurudev. Holy water from the eight holy rivers of our land was poured by Gurudev from a silver Shankha over the Sphatika Lingam. Abhishekam of the Sphatika Lingam is done annually on Mahashivarathri day, while daily puja including Abhishekam is performed on the small granite Lingam. The 65 ft high dome of the Lingam shaped hall reverberates resonantly as the mantras and shlokas are chanted. 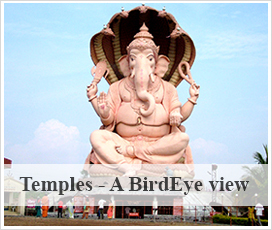 This is indeed an unforgettable experience for many devotees. Lord Sarveshwara is believed to take the avatar of Dhanavantri every Sunday. Hence, a free medical clinic is held every Sunday for the villagers of the neighbourhood.